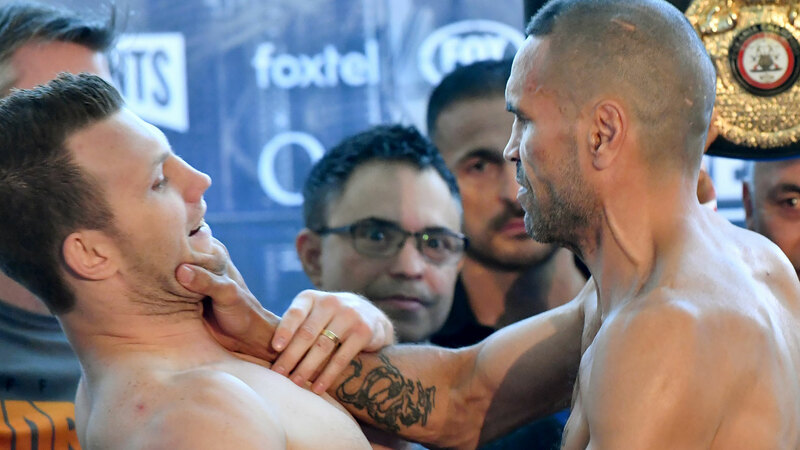 Anthony Mundine and Jeff Horn had to be pulled apart at their official pre-fight weigh-in after the 43-year-old veteran took a swipe at his opponent during the face-off. Mundine was looking keyed up from the get go, bellowing as he took to the scales for an official reading of 70.25kg. Horn, looking significantly bulkier came in at 70.5kg as both fighters satisfied the agreed catchwegith of 71kg. However, tempers flared during the pair’s final face-off as the pair came nose to nose. Horn appeared to lean forward and whisper something into the veterans ear prompting Mundine to shove him backwards by the neck, sending him crashing him into his trainer Greg Rushton. Mundine had to be restrained by his trainers as he began blasting Horn. “I’m just fired up man, I didn’t mean no harm. I’m a caged lion right now,” Mundine roared.